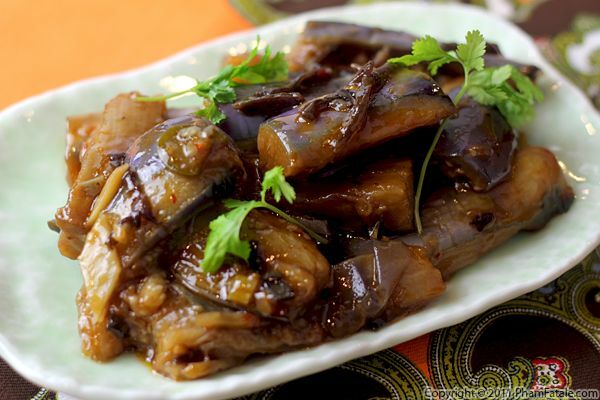 Even though eggplants are available all year-round, they reach their peak during the summer. I was at the store today, and the skin looked very shiny and pretty on the Japanese eggplants, so I picked up several. I made Indian eggplant dip, but since I still had a few leftover, I decided to have some fun with them. Since these were Japanese eggplants, I made an Asian salad flavored with lemongrass and Thai basil. First, I salted the eggplants to extract moisture from the vegetables and reduce their bitterness. A quick trip to the grill, and the eggplants were ready to eat. To give the salad dressing an Asian twist, I used lemongrass, sugar cane vinegar, extra virgin olive oil and wasabi for a little heat. I added some crunch to the salad with crushed peanuts. How easy it that? The first California Olive Ranch Giveaway has already ended and I will announce the winner later on today. Now you can participate in the second giveaway, ending Thursday, September 1st. It takes a few seconds and you could win a bottle of delicious EVOO! If you like California Olive Ranch, join their fan page on Facebook to get daily updates, special offers and deals. I love eggplant, especially in the form of a spread. Baji, my husband's late grandmother used to make the best one, called baigan bharta. I still make this dish very often, but when I use it as a filling (as I did today) I tweak it with a few substitutions. Specifically, instead of using yogurt, I used cream cheese and blue cheese in the eggplant spread. I created puff pastry appetizers that bake in no time and filled them with the yummy eggplant. 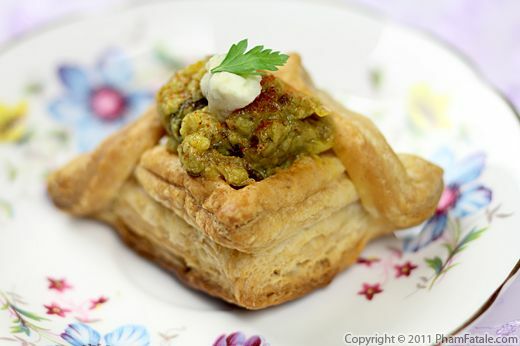 I topped each savory tartlet with crumbled blue cheese as a reminder of the flavor and cilantro as garnish. I was lucky to have any left for pictures, because Lulu and the girls attacked them as soon as they came out of the oven. Whether you serve them in puff pastry or go the more traditional route and prepare a bowl along with some pita bread, it’ll be a hit at your house too. Pasta is always a hit in my home. 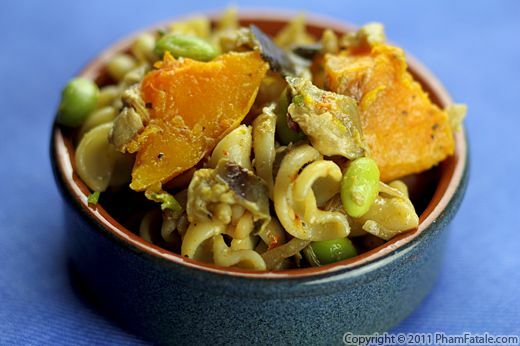 This time, I paired fusilli with roasted butternut squash, fresh edamame soybeans and creamy eggplant. 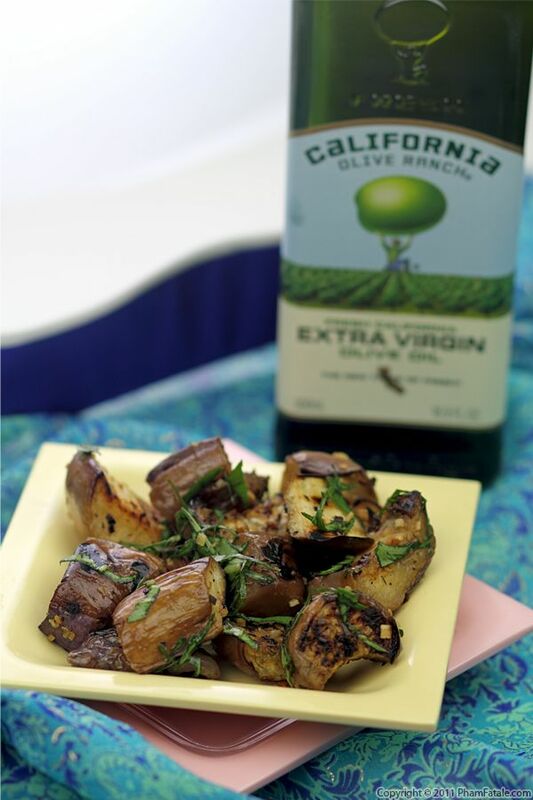 The sauce is made from puréed grilled eggplant mixed with cream cheese, onions and garlic. The winter squash gives more body and a deep orange color to the dish, and of course a pleasant sweetness. My poor husband caught a bad cold that kept him in bed all weekend. I've been taking good care of him, feeding him comfort food and lots of fluids. 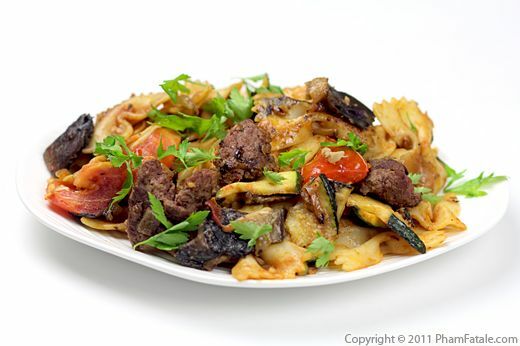 Even though it might not cure his cold, this creamy pasta dish will cheer him up a little! Page 3 of 7 pages.